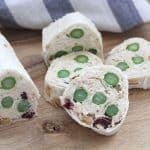 These Pinwheel Asparagus Rolls are the perfect appetizer for a BBQ, holiday gathering or dinner party! 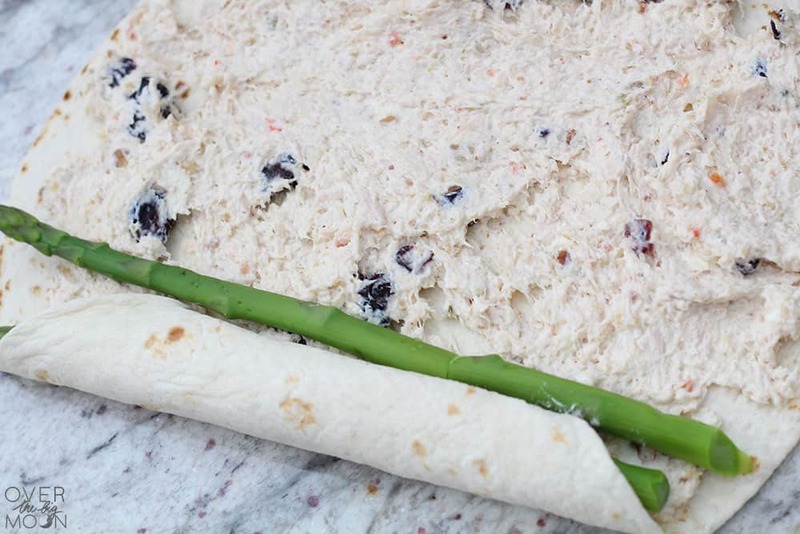 The chicken spread has great flavor, the Craisins add just a touch of sweetness and the asparagus adds a small crunch! 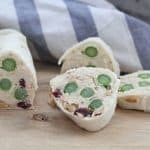 It’s the perfect make ahead appetizer that your guests will love! Hey friends! Get ready to print (or pin) this recipe! It’s one of my major go-to’s for an appetizer! I legit make this at least a dozen times throughout the year! Asparagus is one of my favorite veggies, so I was so happy to find this asparagus appetizer when my mom shared this recipe with me! 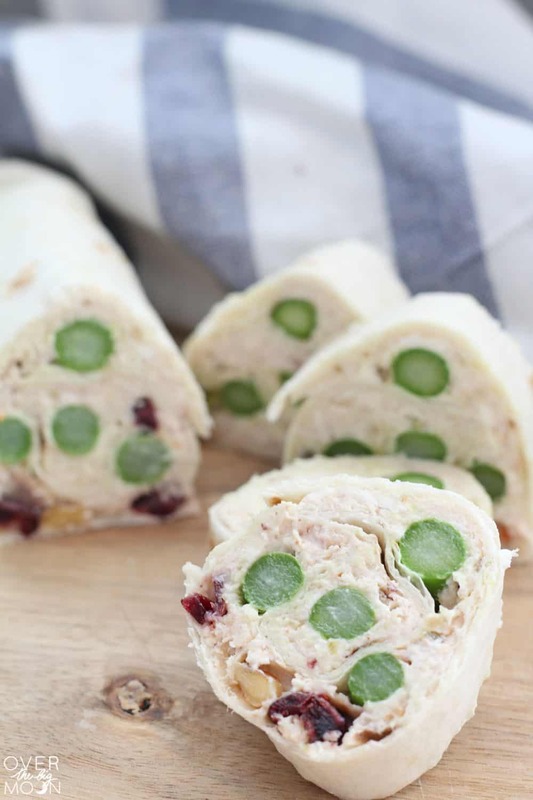 These Asparagus Rolls are the perfect make ahead appetizer too! 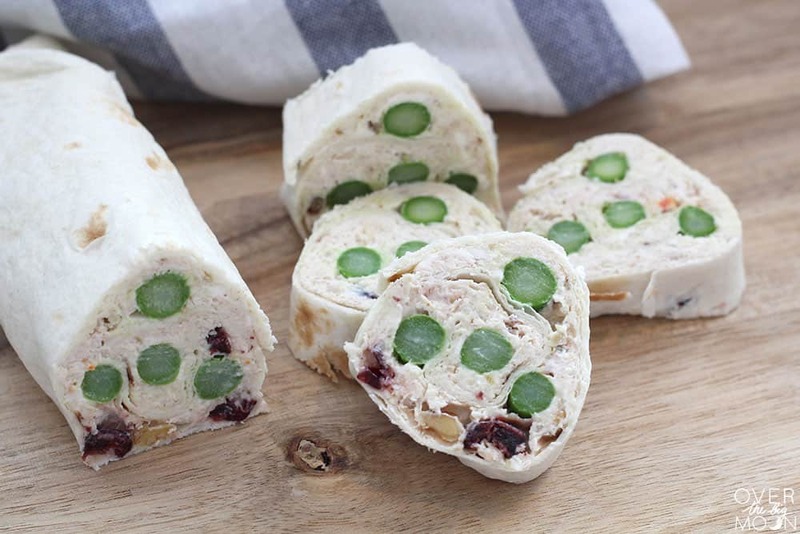 It has such a great presentation, with the green asparagus and red craisins! Perfect anytime of the year, but it is especially my favorite for the Holiday Season! If you have never tried this recipe (or one like it) then you have GOT TO give it a shot! It is always a crowd pleaser and people will be begging you to bring again! A delicious pinwheel asparagus appetizer that everyone will love! If you are cooking chicken breasts, get them cooked and shredded. Cook your asparagus to preferred state - You will want it a little crunchy! Chop your nut of choice. 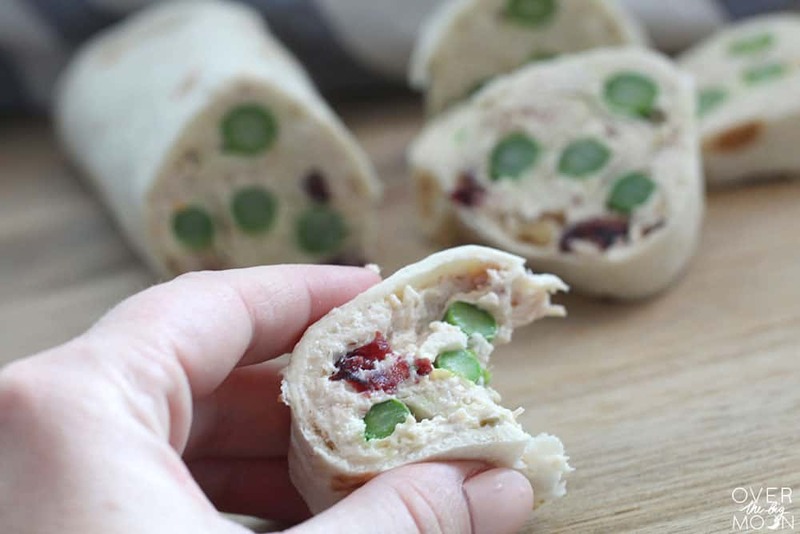 Combine the chicken, nuts, Craisins, Regular Cream Cheese, Garden Vegetable Cream Cheese, Mayo and Garlic Powder and mix by hand or in a mixer. Judge the taste to your preference. Adjust the amount of Garden Vegetable Cream Cheese and Garlic powder if needed. I like mine to have a little bit stronger taste. Strain the cooked asparagus good. Spread the chicken mixture evenly on a tortilla. 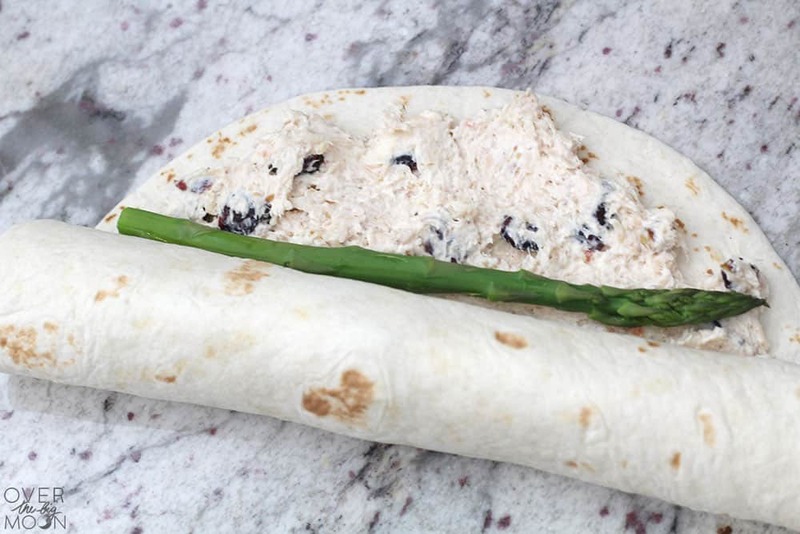 Place the already cooked asparagus on the edge of the tortilla and roll the tortilla around the asparagus one turn. 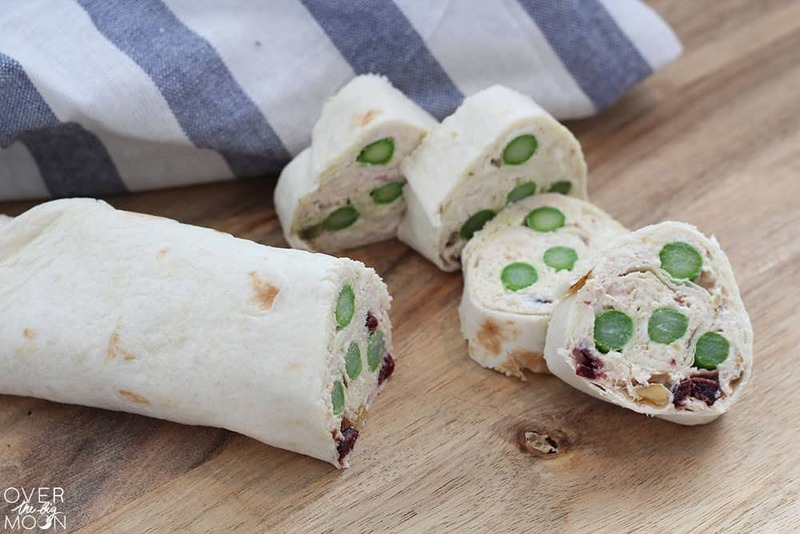 Place another asparagus on the tortilla and roll again. Repeat until the tortilla is all the way rolled. I usually fit 4-5 asparagus, per tortilla. Cover the rolled tortilla in plastic wrap or Press N' Seal. To speed up the process, you can freeze for the first hour. Then cut the asparagus rolls into 1/2" (or so) pieces! When you remove them from the fridge, unwrap them and cut them up in 1/2″-3/4″ thick (or so) pieces. The ends will be ugly when you cut them off, so if you’re like me… you just eat them right then and there! hehe 🙂 It’s my favorite part! If you love this recipe, I’d love you to pin the image below!! Thanks! >These look really good! I'd love for you to link your post up at my Friday Favorites party. This week is a special Holly Bloggy Christmas edition! >I can't wait to try this! I may have to throw a party! >These sound great! Thanks for the recipe!